Cornell University is home to a large, diverse and supportive Jewish community. At the Center for Jewish Living, students of all backgrounds and denominations are welcome. Our religious and social programming events aim to imbue each student with a sense of belonging and community while reinforcing their connection to their Jewish roots. The CJL is an entirely student-run operation led by an elected student board. 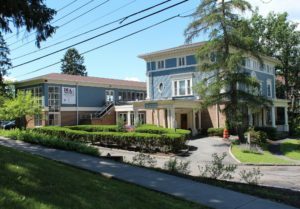 Our house at 106 West Avenue is the epicenter of the CJL community, serving as a home away from home for all of our members. It’s here that students learn, study and hangout in a warm and inviting atmosphere. The CJL is also a full-fledged residence hall with single and double rooms available for rent during the semester. For more information on housing, click here.